What is the best virtual mailbox service? If you’ve ever wondered how to receive your postal mail while you’re traveling or doing business abroad, you’ve arrived at the right place. Whether or not you have a permanent address, if you’re constantly on the move (or if you’ve moved abroad for a length of time), you know how important it is to have immediate access to your mail. Here’s how to do it. Below I’d like to give you a brief rundown of how a virtual mailbox service works followed by a comparison of the best virtual mailbox services for the U.S., Canada, and U.K.. As an added bonus, I’ve negotiated exclusive discount codes for these virtual mailbox services you won’t find anywhere else! I first signed up for my virtual mailbox back in 2014. I’ve been living in China for a few years now and until recently had all of my mail sent to my parent’s home. It wasn’t a bad setup, to be sure, but it was annoying for my parents and I didn’t like having to nag them – particularly during tax season – to carefully check for my W2, 1099’s and other important forms. It took me a while to decide that purchasing a virtual mailbox was a good idea. Security was a concern, as was cost. I had to do quite a bit of research, much of which I’d like to share with you below. This is what I wish somebody could have shared with me before I finally made the decision to buy a virtual mailbox. 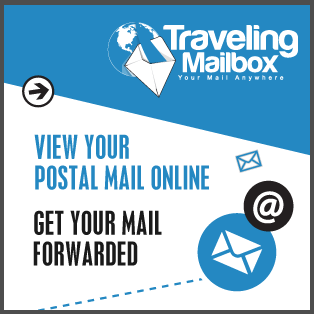 Traveling Mailbox Review <– Includes Exclusive Discount Code! U.S. Global Mail Review <– Includes Exclusive Discount Code! You are given a personal mailbox number that is similar to a PO box but different in that most of these services can accept packages on your behalf. With rare exception, you will never actually visit this mail address to pickup your mail. You choose to discard, archive, open or forward the mail you receive in an email-like interface online. Most service packages give you a certain number of mail “opens” per month (although you can always pay for more if you need). Once you make the request, the company will open your mail and scan it up to a specified number of pages. You can also request that they forward the mail on, which is handy if you’re set to receive a new credit card or a package. It’s really a simple and very ingenious service for those that travel or do business overseas! The only catch is that you’ll have to go through an identity verification process in most countries (further details below) in order to give the company permission to open your mail. It can be a hassle, but personally, I’m glad that security measure is in place. One last thing before I jump into a comparison and review of the various virtual mailbox services available to travelers. During my research I discovered a number of expensive services and companies that I didn’t need. The most common of these services was a virtual office. I know it seems like common sense, but your search online is going to come up with quite a few of these types of companies. Think companies like Regus or WeWork, where actual office space with a receptionist can be rented on a daily or monthly basis. They also provide mail services, but it’s often far too expensive with features that extend beyond the needs of the average traveler. The second service that you don’t need is a simple PO Box from the US Post Office. Again, this is probably common sense, but a PO Box requires somebody to actually come and pick up your mail. A virtual mailbox allows you to check it online while you’re on the road. There’s a huge difference. Below is a brief comparison of the most popular virtual mailbox services of which I’m aware followed by a more detailed review. I personally use Traveling Mailbox, which I highly recommend, but these other services are also great. If you feel like I’m missing a particularly good service, please let me know in the comments section below. In order to legally allow a virtual mailbox service to open your mail on your behalf, you will need some sort of authorization. In the United States, this means filling out USPS Form 1583 and having it notarized. In the U.K., this means sending in proper identification to be confirmed by the virtual mailbox service you use. Here’s the problem I ran into: What if you, a US citizen, already live overseas and want to get this setup? Or better yet, what if you just want the convenience of doing the notary process online instead of jumping in your car? Unless you live next door to a US Embassy or a US Post Office where you can get this document notarized, you really only have one choice: an online notary. This is a relatively new thing but I’ve done my homework…it’s completely legit and legal. I used an online notary to get my USPS Form 1583 notarized and it ended up being a lot easier than I originally thought. I recommend a service called NotaryCam. Using NotaryCam is simple: you download the app on your phone, upload the document you need signed, follow the identity confirmation steps and then essentially have a Skype call with a certified notary in the U.S. All-in-all the process took me less than half an hour. Best of all, it’s only $25 to get it done. While I’ve already mentioned that I personally use Traveling Mailbox, I wanted to provide you with my detailed notes and review of all the other companies that I researched during my quest to find the best virtual mailbox services. Traveling Mailbox has been an excellent service for me over the past few years. Aside from the fact that it was the only company at the time that had an address in Dallas, Texas (which was a huge plus for me), they are also a well-rated and very professional company that has been around since 2011. Of the unique features that I’ve come to enjoy about Traveling Mailbox, I’ve really enjoyed both the dedicated phone app (this is huge for me) and the ability to integrate with Evernote. I’m an Evernote user so having the option to upload scanned mail directly to the app on my phone is a huge plus. They also allow me to tag and organize my mail similar to how you would with your email, which makes searching and archiving that much easier. Of course, they also offer all the traditional virtual mailbox services you’ll find with all these companies, services such as check deposit, parcel forwarding, shredding, etc. For the Extended and Small Business plans that they offer, they also provide a fax number that you can use to receive faxes. As a bonus, get 2 months FREE service when you sign up for a year! Click here. Finally, in terms of security, I appreciate how Traveling Mailbox is very transparent about their practices. They are officially authorized by the USPS and their offices are kept under video surveillance at all times. Started back in 1998, US Global Mail is one of the most established US companies on this list of best virtual mailbox providers. They’ve been used by thousands of travelers over the past decade and have a good reputation with a high Better Business Bureau rating. When it comes to reliability and trustworthiness, US Global Mail is a leader on this list. While they have plans that focus on businesses, I’m going to spend my time here on their individual and family plans that seem to fit the average traveler best. Their primary selling point is that there are no hidden fees. You know up front how much it costs to forward each parcel and how much it costs to open and scan each letter. Unfortunately it doesn’t come with a set number of scans, which leads me to believe that US Global Mail is geared more toward the traveler who wants to have their mail forwarded along more often than scanned. As an exclusive bonus, use the promo code “TCC” for 1 FREE month of service (min. 3 months). Click here. The only downside is that they only have one location: Houston, Texas. There are no options for other cities or addresses. Single address aside, if you’re willing to pay for 3 months, a year or two years up front (Update 2019: they now offer month-to-month plans! ), you can get incredible savings that easily make this the cheapest virtual mailbox on this list. That alone may be reason enough for you to choose US Global Mail. The Bottom Line: If you don’t mind a Houston, Texas address, this is the best value for your money as a virtual mailbox and forwarding service. One and two-year plans beat the pricing on any other service on this list. For those travelers who need a Canadian address, the best option I have been able to find (in fact, one of the only) is eSnail. Thankfully, even though your options are limited, it’s still a very good option as a virtual mailbox while you’re traveling. There’s only one option for an address in Vancouver, but they offer all the features you might want – plus some – with any virtual mailbox. You can forward mail, scan it, or securely shred it. On top of that, if you receive magazines you can have them either forward it on OR scan the magazine in its entirety for you to read. The magazine scanning service comes at an additional fee, but I don’t know any other service on this list that does this! They offer the “Backpacker” plan for as low as $12.50/mo (when you purchase for the year), which in my opinion is about right for most travelers. If you receive more than 10 pieces of mail per month, however, you’ll probably need to upgrade to the “Basic” ($18/mo with 20 scans) or “Personal” ($20/mo with 100 scans) plans. The Bottom Line: If you need a Canadian address, eSnail is an excellent option with low-priced plans that will meet your needs. For those travelers who have need of an address in the United Kingdom, the best virtual mailbox service is UK Post Box. In fact, I love some of their features so much I wish that I could find a similar company in the United States! To begin, UK Post Box offers what I have come to expect with almost any virtual mailbox service: document scanning, parcel forwarding, check deposit, etc. In addition to these features, though, they also offer two more that set them apart: multiple UK addresses and the ability to send mail from the UK. UK Post Box offers a number of UK addresses and PO Boxes, although the pricing for each depends on location. These can work well for both individuals and businesses and if you decide to go for a cheaper PO Box, the good news is that they offer what are known as “courier points” to make sure that you can have packages delivered (since they can’t be delivered to PO boxes). The second unique feature of UK Post Box is the ability to send mail. That’s right, you can write a letter, upload it to your account and have them print and mail it for you! Save money on postage by making it a domestic instead of international mail. The Bottom Line: If you’re in the UK or need a UK address, UK Post Box is one of the only services you should consider. As you can see, there are a number of great options to choose from. All of them will help you take care of your mail while you’re out and about but each of them offers a unique selling point. Figuring out what is important to you while you’re gone (access to fax? business needs? short term? specific city?) will help you narrow down which virtual mailbox service is right for you. What do you think? Do you have experience with any of these services that you’d like to share? Or perhaps there’s a service not listed here that you think deserves a mention? Please leave a comment below! I would only add to your post the fact that I do not believe that you can forward mail from the virtual address so if you ever want your mail to be redirected, you can not use the USPS to do it from that address not can you use the virtual service to do it. You have to notify everybody you receive mail from about your new address. Hey Ilan, I’m not sure I understand completely. At what point are you talking about redirecting your address? Before or after using the virtual mailbox service? After. You can forward your mail from your normal real address to the virtual address so starting the service is not a problem. I believe that when you try to cancel the service, or change it to another provider for that matter, this is where the problems start . By law, these companies need to forward your mail for 6 months after you cancel service. Same as the US Postal Service does. I’m curious regarding the comment regarding changing your address/forwarding your mail once you no longer need the service. What do you do? Thanks! It’s just like moving under any other circumstances – you’ll alert the USPS and they should redirect any mail coming your way for a period of time. Each of these mailbox services is different so you’ll need to ask them what their policy is for forwarding. Anyone used Shipito for mail scanning and forwarding? Those who did what has been your experience? Hey Felix, the difference between Shipito and the above options is that Shipito is a forwarding service. What I’m talking about here are virtual mailboxes that allow me to scan everything that comes to me and decide whether or not I need to forward it along. Yeah, I am aware but Shipito also offer that and storage of up to 180 days. They charge $1 processing and $2 scanning. Great article! I wish I had found this at the BEGINNING of my research today. It is by far the most carefully written. But I’m struggling with a question here… You (Josh) say that the limitation of the one Houston TX address for US Global Mail and the presence of a Dallas TX address with Traveling Mailbox were significant factors to you. I live in a Dallas suburb (Lewisville) and initially felt the same way when I started looking into this – that having a Dallas address was a real perk. But I called both those companies today (US Global and Traveling Mailbox), and found out that the Dallas address with Traveling Mailbox is in a UPS store that 2nd-day-air ships received items to their facility in North Carolina for processing. It makes me wonder if mail going directly to the facility (presumably Houston) has a few advantages, like cutting out a step that adds both room for error (lost, misplaced, misdirected, more “transfers”, etc.) and reducing processing time by a few days. Another service centered in Austin TX (scanmailboxes.com) looks like it is comparable to US Global, but offers addresses only in Austin TX (I think). Nice work, Bob! Glad you took the time to give them a call. Personally, the process for the Dallas address doesn’t bother me – I wanted a Dallas address that bad. 🙂 You make a great point, though – more steps means more room for error. Thankfully, at least in my case, I have yet to experience that error. I like US global because they will use various shippers, like DHL but Correct me if I am wrong but US global says they charge $3 for each page scan. that seems absurd! Traveling Mailbox only uses USPS to forward. This can get crazy $$$ with packages forwarded. – And $.4.95 per package received. So if you have 10 packages come in a month then that is a lot of package fees. I don’t see either of these companies as viable. Your discount codes don’t work or don’t do anything for Traveling Mailbox and Earth Class Mail. I appreciate your review but it seems a bit out dated. Hey Henry, sorry to hear you had problems. The review isn’t out-dated, I can assure you – I’ll double check with the two companies but the discount codes should still be active and have been used by many people this past year. Unfortunately, the process where Traveling Mailbox sends everything to North Carolina means serious delays for me (Dallas). Some mails won’t show up until 2 weeks after they were originally sent(!). Have used this service during long trips abroad for almost two years and both delays and errors have been numerous. Some letters have also been returned to sender, even though letters have had the correct address. Just too many flaws to be completely trustworthy. Thanks for your thoughts, Mark. Not sure what to say to you – I’m in the exact same boat you’re in (living abroad, using Traveling Mailbox for a couple years, using the Dallas address) and I haven’t had any delays or errors. Mark, what is your solution? Have you found something that works better? I have a corporation in New York, USA. I’m looking to obtain a virtual address in order to register my branch in Toronto, Canada. Hi Josh – If this question is better suited for private message please let me know, but I’m sure someone else will benefit from the answers if you have them. I’m now in the last stages of preparing to embark upon a journey a little like yours except to Eastern Europe. And since you are apparently from the Dallas area you will almost certainly have knowledge about a few specific things I need to know. Does having a TravelingMailbox.com Dallas address cause any complications for things like your Texas Driver’s License? Almost always it seems that the state wants a PHYSICAL address, not just a mailing address? Or do you just not even tell them that it’s only a mailing address? Also, if you live in Dallas city limits you may not know the answer to this next one, but I know in Dallas (city limits) one pays for things those outside of Dallas don’t, like property tax on vehicles and higher premiums on most insurances, etc. And, all that is driven by the physical address. So if as a Lewisville resident I move my vehicle registration to a Dallas address, insurance goes up, property tax now becomes an issue, etc. Did you deal with any of that, or did you just offload car and abandon your TX Driver’s License? I’m just trying to work out a few last minute details! Hey Bob, great questions. I’m not 100% sure I understand everything you’re saying but I’ll try my best to answer. First things first: I did offload my car but I’m still a home owner. My property tax remains the same because that is based on the location of the property, not my mailing address. As for insurance, if you’re dealing with a car that won’t be driven much while you’re gone, this is something that you can take up with your insurance company. Often they can give you a reduced rate – no matter where you live – if they know that the car isn’t being driven while you’re gone. Finally, most services – which includes driver’s licenses – allow for you to have a “permanent address” in one place and a “mailing address” in another. So some people use their parent’s, friend’s or personal home as their permanent address and then use this virtual mailbox as a mailing address. That’s what I do. Regarding Bob’s questions of Sept 11 – I would love to hear the reply to those excellent questions! We’re in Houston, but had not thought about drivers licenses and insurances with respect to “physical address”. We’re just starting to research this (we’re leaving the states for a while in early 2017), but I’d like to test drive our final choice for a while before actually leaving. What about virtualpostmail? When I first googled this subject, they came up first, but they’re not even on your list. Maybe they just pay google for that placement, but US Global didn’t come up from google at all?! Hey Jeff, great questions. I’ve never heard of VirtualPostMail – likely was a Google ad. I can’t verify whether any of these services shows up in Google, I only know what I’ve personally experienced and researched. Thanks a lot for this post. It’s very timely for me, How about Post Scan mail ? It will help a lot to make the right decision, if you can mention a list of details to pay attention to when selecting a parcel forwarding company. Hi Matthew, I’m glad it was useful! I’ll think about your suggestion…the biggest issue I see is that the “list of details” will probably change depending on the reason for your need of a virtual private mailbox. Anyway, thanks! Thank you, David! I’m glad you found it useful and I wish you the best in 2017 as well. Fantastic article. Exactly what I was Looking for. Here is my question. I need one of these for a few months at a time, a couple times a year. It seems like the constant forwarding and changing addresses would be a mess. Hmm…that’s definitely a personal preference question if you ask me. I feel like it would be annoying to constantly change your address over and over again throughout the year, not to mention the time it takes to set up the service. If I were you, I would just eat the cost for the first year and just see how it goes. I think you’ll like it a lot better. I do it for a few months at a time. ForwArd for a few months then stop. Begin the forward a few months later. The reason i so this is because the USPS will Only do a temporary ForwarD for a certain aMount of time. I do not believe they will Do a temp FORWARD for a full year. Interesting strategy, Vincente. You would still need to do a Form 1583 with the USPS, though, in order to allow the virtual mailbox company to accept mail on your behalf, forwarded or not. I have to leave a note recommending virtual post mail, I’ve been using them for 3 years and if a California address works for you I highly recommend them. They’ve gone so far above and beyond with their customer service I can’t bring myself to cancel even though I need a Florida address. I’m searching now to find a second service that offers a Florida address. VPM customer service was super responsive and went well beyond the norm helping manage a visa application, adding emailed documents to received files, tracking down refunds on shipping errors from the sender (not the service). If anyone has a FL provider they love as much it would be great to hear! If the mail forwarding services uses an address in a state with state income tax, do I run the risk of having to pay state income tax? That’s a great question, Mike, and one that I’m not qualified to answer. You’ll need to speak with a tax professional in the state you’re referencing to find out for sure. I actually contacted TravelingMailbox.com about this question. North Carolina where TravelingMailbox.com is located does have a state income tax, but Traveling Mailbox support says that this does not establish business or personal presence in the state for tax purposes. BUT, the way I looked at it was that if paying the $5 per month extra to have a “Premium Address” (where it is a different city) in Dallas TX where I’m from kept me from having EVEN ONE conversation with an N.C. state taxation official, it was worth it! So, technically you probably won’t run any risk, but you may have to jump through some hoops to prove to tax officials that neither you nor your business are located in N.C.
You may want to verify my info with Traveling Mailbox yourself, but I stand by my logic… Better to not even give the question a chance to come up. Esnail starts at $25. Maybe it changed since you checked it out. I’d love a Canadian option that’s lower than $25/mo but I don’t think it exists…sad. Hey Matt, so there is a “backpacker plan” that only costs C$17 just so you know. Sorry to say that I don’t know of any cheaper options. that’s a very innovative idea and I don’t know, this service is aVAilable in India or not? IF not then someone has a good opportunity to start a new business. Thanks for the article, it’s very useful. I haven’t been able to find any reviews of UK virtual mail forwarding companies except on TrustPilot, but apparently those being reviewed tend to delete any negative reviews they get. Has anyone actually used UK Post Box or any other UK service and what is/was your experience of them? Hi Melanie, thanks for the comment! Hopefully somebody can answer a little better than I can. I have set up an account with UK Post Box and it was very easy to use. I like the interface but I admit that I haven’t actually shipped anything to them/from them. Perhaps another reader can chime in with their experience with UK Post Box? I am planning to move back to Taiwan and I am wondering if this mail forwarding service will affect my state tax. I live in Michigan and currently hold a michigan driver license. if i sign up with traveling mailbox (maybe illinois address), do i have to change my driver’s license to illinois? do i still fill michigan tax return? i am really confusing about this “residential” address and mailing address. i will be living in taiwan, actually not in the u.s.
i am an u.s. citizen so i still have to deal with the tax return even live overseas. The address where you receive mail isn’t the same as your “home address.” It matters what your driver’s license says – and no, you don’t have to use your Traveling Mailbox address. I would recommend against it, actually. As a U.S. citizen, you need to have a home base and you may or may not have to pay state taxes (although you likely won’t pay federal taxes unless you make a ton of money. Whatever you do, DO NOT USE ESNAIL!!! I signed up with them after reading this and comparing, but absolutely regret it. I’ve never seen a more inept and incapable company. I requested that they forward a very important piece of mail internationally, and noted that they need to include my forwarding address in the language of my country (gave it to them to copy paste, simple enough). This apparently blew their minds, because and they said they didn’t know how they would put the address on the envelope. Do they not know how to use a printer? After several weeks of waiting, the customer service person just dropped off. She apologized that she was “busy”, so I gave her a pass. Over a month later I was travelling and really needed that card, but too late. Since then I’ve followed up 4 times with requests over the span of a few weeks and still have not received a response. They’ve basically stolen/are withholding important mail of mine and I have no way to get it. I don’t know if I’ll ever hear back. Esnail is the most worthless service I’ve ever paid for – please don’t make the same mistake I did. Thanks for the feedback, Hudson. Very helpful. Still, that was far too long for you to wait for your mail. Typically in this situation We offer refunds and anything we can do to amend for problems like this, however, none of our employees can find the emails you sent after the request to send the letter. Please contact us at [email protected] if you have a follow up, or just click create a task on the letter you want to forwarded. This is the fastest way to ask for service. What if you dO not have a pHysical address? We sold Our house and will be full time in our rv so we need a mailing address. We will need to chAnge our drivers LICENSE and register our vehIcles as well. i have been researching and am so confused. How do you establish a residence for tax purpose if We are always moving around? Any input would be extremely appreciated . Hi Laura, for the purposes of a driver’s license, vehicle registration, and taxes, you’ll probably want to find family whose address you can use. You’ll need to file state taxes in the state where you’re registered with a license, so I would stick with one that you know. A virtual address is still a great option for you as a full-time RV’er, but it’s not going to solve your tax/registration questions.